When we hear the words “student strikes,” we immediately think of red felt squares, streets flooded with protesters, smashed cop cars, and the unforgiving police officers of the 2012 general unlimited strike. But, the student movement in Quebec started long before then. In 1946 in Grenoble, France, The Charter of Grenoble—or Charter of Student Syndicalism—was written, and became the foundation for student unions. A similar charter was adopted by the Association générale des étudiants de l’Université de Montréal in 1961. At the beginning of the 1960s, students had the choice between anglophone universities (McGill University, and Sir George Williams University, as well as Bishop’s University in Sherbrooke), or francophone ones, nominally Catholic faith universities (Université de Sherbrooke, Université de Montréal, or Quebec City’s Université Laval). Between 1963 and 1964, the Commission royale d’enquête sur l’enseignement dans la province de Québec released the rapport Parent, which highlighted systemic problems with education in the problem and urged for reforms. These reforms brought forth the creation of CEGEPs in 1967, a second francophone university in Montreal—Université du Québec à Montréal—the ministry of education, and more. Student syndicalism saw its beginnings in 1963 and 1964, with the formation of the Union générale des étudiants du Québec, which fought for free tuition in 1966 and partook in the 1968 student strikes. In 1968, students grew frustrated after the Conference of Rectors and Principals of Quebec announced on Sept. 4 that they had to turn down 4000 students, due to the influx of francophone students CEGEPs brought. As CEGEPs began offering free secular education to Quebec residents, education was in high demand. The same day as the announcement, UGEQ cut communication with the provincial government. By Oct. 15, 15 of the 23 CEGEPs were on strike, and mass protests took place in the province demanding the creation of a new public university, revisions to the loans and bursary programs, and changes to the administration and teaching methods of CEGEPs. The strikes ended on Dec. 18 1968, resulting in the founding of l’Université du Québec, making higher education more accessible for francophones by opening ten provincially run public universities in Quebec. In 1974, CEGEPs went on strike on Oct. 9 to remove the Tests d’aptitude aux études universitaires—standardized testing—which Quebec suspended. In November of the same year, students mobilized for better loan and bursary structures. Over 30 CEGEPs, some high schools, and university departments joined the movement, totalling 100,000 students on strike. The government announced the Quebec’s loans and bursaries program—and a truce was called. Student syndicalism took on a new form in 1975, and a coalition by the l’Association nationale des étudiants du Québec was formed. The truce between students and the government was broken by Rimouski students in 1978, when they went on strike to ask for free education. This was the first offensive strike the province had seen, rather than a defensive one. Students were demanding something from their government, not reacting to one of their decisions. ANEQ backed them up, and over 100,000 students across the province participated in a general unlimited strike. UQAM later joined the movement, and the government announced major financial changes to the loans and bursaries program. In 1986, the provincial government announced tuition hikes, along with cuts to their loans and bursaries program and functioning budgets, prompting CEGEPs and l’Association générale des étudiants de l’Université du Québec à Montréal to hold strike votes. Five days later, the government announced tuition freezes until 1988, and more reforms to the loans and bursaries program, putting an end to the strikes. On Oct. 26 1988, negotiations stagnated, and 100,000 CEGEP students announced a three day strike to improve the loans and bursaries program. ANEQ announced they were in favour of a general unlimited strike on Oct.29, and about 20 student associations joined, though many CEGEPs opposed. The movement quickly declined, and the strike ended on Nov. 13. Though the movement had seen victories in prior decades, they faced failure in 1990. 1989 saw the formation of the Fondation de la Fédération des étudiants et étudiantes du Québec—which later became the Fédération étudiant universitaire du Québec. Tuition hikes were announced, going from $500 to $1,600—a $280 annual hike over four years—which the FEEQ opposed. Only human sciences and art students at UQAM, l’Université du Québec à Rimouski, and 12 CEGEPs were able to get strike mandates, with Université de Montréal joining later. There were protests and arrests, but students were unable to build resistance. Over the next four years, student federations took over the syndicalist movement. This led to a more ground-based approach to organizing as individual associations took on mandates independently, though it was also criticized for lacking a united front. In 1996, hopes for 30 per cent tuition increases were announced at the Sommet sur l’education supérieure. The Mouvement pour le droit à l’éducation, which was formed the previous year as ANEQ’s successor, proposes an ultimatum: keep CEGEP free, back down on hikes, get rid of the R Score, and reinvest into the loans and bursaries program or face direct action, strikes, and occupations. After a strong strike turnout, Lucien Bouchard’s government hiked tuition, but only for international students, and added some restrictions in the the loans and bursaries program. Tuition fees were frozen until 2007. A general unlimited strike began on Feb. 21 and, at the height of the momentum, around 185,000 students mobilized. After nearly six weeks of striking, the ministry of education offered to reinvest $482 million of loans to bursaries over several years, and promised to bring back the full $103 million by 2006. In 2005, Quebec saw its largest student strike yet, and it set the precedent for 2012 and 2015 strikes. The previous year, the government had announced that it would convert $103 million of bursaries to loans instead. The FEUQ signs on to the deal and drops pressure tactics, while ASSE continues to strike until April 14. By mid-March, more than 200,000 students are on strike, pressuring the Liberals to backtrack and restore the full amount. In 2007 the Bouchard government’s freeze on tuition fees expired, and tuition hikes of 30 per cent over five years—a $500 increase—were announced, with further hikes planned for 2012. ASSE launched a general strike demanding free tuition, but only a handful of student unions joined and they were unable to reach the quota they decided for a general strike. With internal issues and problems mobilizing students, partly due to unrealistic goals, the hikes went through. This finally brings us to the famous 2012 strikes, which lasted for over 100 days and only came to an end when Jean Charest lost in his own riding during the provincial elections. In March 2011, Finance Minister Raymond Bachand announced Quebec’s intention to raise tuition by $325 a year over five years, beginning in 2012. The total increase would amount to an additional $1,625, raising Quebec tuition to $3,793 in 2017. Though Quebec’s tuition fees remained among the lowest in Canada, the increase would have brought the amount of students graduating with debt up to 61 per cent. Some argued the hikes would only benefit students and change the quality of the education. Upon closer inspection, it seemed the hikes would change how education was funded, by shifting funding from the public sector to the private. “I’m going to university next year and if the tuition hikes go up I’ll be paying $325 more every semester and won’t receive any more service than the students that are currently in university,” Lenny Leprince, Director of External Affairs at the Dawson Student Union, told The Link in Oct. 2011. A massive demonstration was planned for Nov. 10, 2011. The day of the demonstration, 14 students decided to try and occupy McGill. Security tried to stop them, and the protesters claimed that they used excessive force. Over 100 police officers were present, despite McGill saying they only requested four. Students from Rimouski, Chicoutimi, and more came to Montreal for the protests in front of Jean Charest’s office, which remained peaceful. On Feb. 13, 2012, student groups voted in favour of a walkout. Over the next four months, students flooded the streets, occupied, picketed, and disrupted the peace, while being met with police repression. Ten days days after the walkout vote, students occupying the Jacques Cartier Bridge were dispersed by police using pepper spray. In early March, student Francis Grenier suffered a severe eye injury, allegedly because of police stun grenades. At protests afterwards, students wore eye patches along with the red squares in solidarity. A few weeks later, students occupying the Champlain Bridge during rush hour were all fined $494. A peaceful protest on March 22 saw over 100,000 protesters, showing that the movement was only growing. That same week, students started to target large economic symbols and blocked access to SAQ offices. In early April, the outside of Minister of Education Line Beauchamp’s Montreal office was painted red. Metro systems were shut down after students threw bags of bricks onto the tracks. Four Quebec cabinet ministers’ offices were vandalized, some with Molotov cocktails. By April 24, street protests were held every night in Montreal, all varying between brief and peaceful or monumental and chaotic. Negotiations between the government and students had begun on April 23, but were suddenly halted two days later by the government, prompting riots. That night saw eighty-five arrests as protesters smashed the windows of banks and businesses and damaged cars. The next day, students were denied a place at the negotiation table, as the government did not want “radicals” present. On April 27, the government revealed a new plan of action: it offered students a slightly slower phase-in period for the hikes, more generous loans and bursaries, and future hikes indexed to inflation to try to get students to resume classes. On May 4, protests taking place outside a Liberal convention in Victoriaville resulted in another young protester losing an eye due to riot police. Others kicked and beat a police officer. After more failed negotiations, on May 16 Premier Jean Charest announced his plans for Bill 78 to ensure student’s rights to receive education at their school were not being impeded. It involved restrictions on protesting and picketing on university grounds, and that protests of 50 or more people anywhere in Quebec must provide proposed venues and routes to the police prior to protesting. The same day, masked protesters stormed universities and disrupted classes. Bill 78 passed on May 18, imposing fines on those blocking schools and giving police the right to refuse protest locations. The opposition called it a “dark day in Quebec history,” saying this law impedes on civil liberties and limits democracy. Montreal also passed a by-law stating that people could be fined for wearing masks at certain protests. Protesters in Montreal started bonfires and barricades in the streets, while police were accused of using excessive force. May 22 marked day 100 of the student strike, and tens of thousands of people participate in a massive march in Montreal, with many protesters deliberately deviating from the announced route. Solidarity demonstrations were held elsewhere in Canada, like in Calgary, Vancouver, and Toronto, but also internationally with Paris and New York. Labour unions within and outside Quebec continued their support of the strike as well. When the Liberals called for an election for Sept. 4, it backfired and Charest lost his seat, taking the tuition hikes with him on his way out. Pauline Marois was elected as premiere. Nadia Hausfather, who wrote a PhD on strikes and their impact on emotions, stressed that holding general assemblies was what stuck in her memory when reflecting about her experiences. “It’s very exciting to have the chance to talk to other students about important issues and then make decisions together about them,” she said. Hausfather also highlighted the significance of the accreditation act, which gave student unions access to membership fees, making it easier to mobilize, and how without general assemblies and campus activity, there would be no strike mandates. The student movement sparked once again in 2015, against Philippe Couillard’s government’s austerity cuts, with added critiques against Quebec’s fossil fuel industry. Quebec had been seeing major austerity cuts with the previous Parti Quebecois government, and the Liberal party continued to cut funding for pensions, healthcare, and education. By October 2014, $172 million had been cut from the education budget, with more to come. Scholarly expenses were going up by 2.9 per cent, and Concordia was making $15.7 million cut, which would result in the loss of 180 positions and a $12 million reduction in yearly operating costs. September 2014 saw the inception of the Printemps 2015 movement. The coalition was formed after the association for social science students at UQAM voted in favour of a strike mandate. The goal of P15 was to break away from ASSE’s centralized and student-focused approach to build cross-sector solidarity with labour unions and other unaffiliated individuals as the issue affected the entire economic-political sphere. ASSE jumped on board and passed a motion supporting P15. Unlike the student movement of 2012, P15 only had six months to mobilize, and with a lack of a central decision-making body, they lacked enough public education. Many didn’t understand what austerity or its implications were. P15 was also unable to slowly escalate tactics or use of direct democracy, which would have reduced student opposition to the movement and facilitated grassroots mobilization. Despite this, Spring 2015 gained a lot of momentum. At Concordia, 12 associations took up strike mandates. In March 2015, 38,000 students were on strike. Montreal became the de facto core of the movement, because the movement started at UQAM. For several weeks, students blocked and disrupt classes and held nightly protests, which were met with severe police repression. Some Concordia students sent clowns into classrooms to disrupt and effectively shut them down. Students who were present at these protests recall the brutality and excessive force used by the police against protesters. Protests would be deemed illegal minutes after starting, giving the police the authority to use crowd control tactics such as tear gas, pepper spray, kettling, and using their batons and rubber bullet guns. May 1, also known as Mayday, saw 35 labour unions and 200 community organizations on strike along with students. It ended with about 100 arrests. Protesters caused public disruptions, blocking access to buildings, highways, and construction sites, and held large marches. However, in spite of mass mobilization, May 1 marked the decline of the Spring 2015 movement rather than adding momentum, and failed to change the mind of Couillard’s government. Part of the failure of the P15 movement was its separation from ASSE. These “executives” set up media lines and acted as spokespeople, but because they had no official position on the movement, they lacked representation and accountability. Before the first two weeks of striking were over, ASSE had released a statement asking for a “strategic withdrawal” to pick the movement back up in the fall while taking the summer to develop better tactics. The statement was interpreted as being anti-strike by the media, and P15 rejected it entirely—deciding to go full-steam-ahead anyway. Shortly after, all of ASSE’s executive team were fired by vote in a congress with delegates of member associations who held strike mandates. By then, there were no more strikes outside of Montreal. Regardless, the movement resumed in the fall, though it had shrunk significantly. 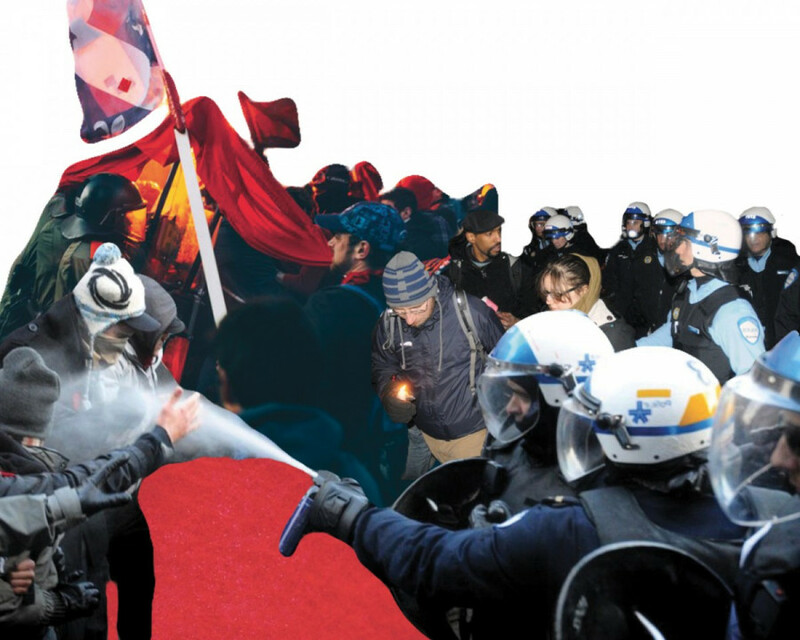 In September 2015, Concordia and UQAM students protested the political repression they claimed they faced from both administrations after 25 Concordia students were to undergo tribunal and nine UQAM students faced expulsion for using strike tactics. Thanks to this, Concordia only gave students letters of reprimand. On Dec. 18, a large protest was infiltrated by undercover police, leading to mass violence, and allegations of a police officer pulling a gun on a protester were spread among the demonstrators. Highlighting major repression, the collapse of ASSE, and lack of solidarity, that day marked the death of the P15 movement. Though whether or not the 2015 protests were effective is still up for debate, after two years, the government has reinvested most of the money they had cut back into education. P15 helped activists explore which tactics were effective, which weren’t, and build solidarity and alliances that lasted well beyond the 2015 protests. Miller stressed the importance of students being involved in their respective unions and keeping up tradition of organizing, adding that the student movement is in a rough period of questioning their tactics. Finally, this brings us to today. Last November, about 58,000 students took to the streets demanding an end to unpaid internships. For the first time since 1978, students are demanding something from their government rather than reacting to government’s decisions. In November, a Coalition of Quebec associations involved held a one-week strike as an ultimatum: If all internships weren’t paid by winter, they would go on a general unlimited strike. The second wave of the unpaid internship strikes was launched on March 18, with the beginning of their general unlimited strike. The Link’s editor in chief, Miriam Lafontaine and the author of this piece spearheaded the journalism department’s strike from March 18 to March 22.